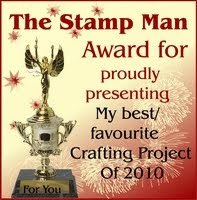 The Stamp Man: Happy Christmas Everyone! We've had quite enough snow now, these photos were taken on Tuesday after a bit of a thaw and we've now had so much more since then in our little village. Flipping heck... Enough is enough I say! Hamish has really enjoyed playing in it when it was this deep but since we've had even more, I think even he has had enough of it. 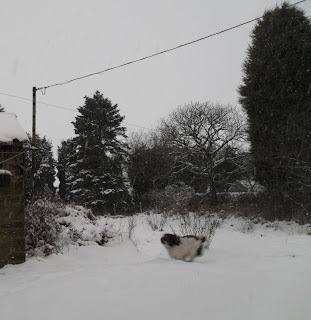 It's getting a bit deep for his little legs, and springing about in it for too long seems to be hard work for him now. 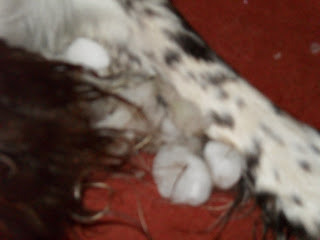 I was playing chase the snowballs with him, when we came in I realised he had brought some snowballs in with him, they had got so caught in his fur I couldn't remove them. How did he pick that lot up? He decided to eat them off... what a mess! I hope you have all managed to finish all your shopping, and are over the worst of the prep so you that can enjoy the next few days. If you are travelling visiting family I hope you have a safe journey. We finally managed to get our food shopping done yesterday, as it snowed heavily again on Tuesday night, I thought we may be eating whatever we could find in the freezer over Christmas, but by lunchtime the road was a little better after having the sun on it. It was actually a lovely winter's day, but not nice to have to drive on the roads as they are. I did forget tin foil and icing sugar. I'm sure we really can manage without both. I picked up a tip about grinding caster or granulated sugar into a powder to make icing sugar so as the weather is horrid again today, I'm sure I'll still be able to make the brandy butter and dust the mince pies:) There's probably a lot worse that I've forgotten. Another top tip, don't live in a village that doesn't have a corner shop! I hope you all have a wonderful Christmas, thank you for all your great comments and support for our blog since I started it this year, it's become another wonderful hobby, and it has been lovely meeting and getting to know new people through it. 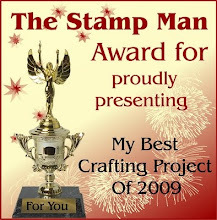 I also hope you will join us here for our blog hop and awards that starts on Sunday. We will be starting at 11am, bring a mince pie and something warming to drink with you and join in for as long as you like. 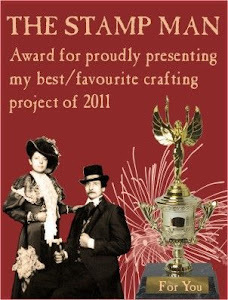 It will be lasting a week, there are 16 brilliant prizes to win too, so do pop in whenever you can, do the blog hop and also take part in the awards. Don't be shy, it'll be great if you introduce yourself so we can get to know you too, especially with the awards! PS: I will be back later with a short post to announce the winner's of the blog candy giveaway no.3! Just to wish you a very Happy Christmas Jill. You don't know me but I've seen you on C & C and I do buy through mail order and love the things you do. Happy Christmas, Jill! 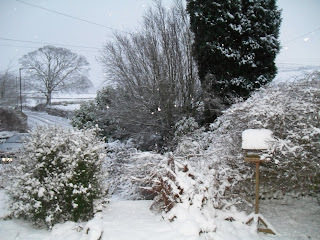 I'll be joining in with the blog hop as everyone should've gone home by then...unless we get more snow! Hope Santa brings you lots of goodies, and thanks for all the inspiration this year! The snow is ceertainly special for christmas,Jill. Freya has been in her element today declaring it the best Christmas ever!!!!! (and Santa hasn't even been yet). I certainly can't remember snow like this on Christmas eve before. I know we are lucky in that we can walk to town with 15mins, which we did today and we've got a corner shop so the snow doesn't bother us at all but I know it causes problems for others so you have my sympathy. Wishing you and Ian a very Happy Christmas Jill. Really looking forward to your Blog Hop, hot chocolate and mince pies sound lovely. 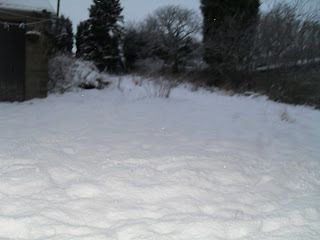 PS I am a little envious of your snow as it looks like it is going to disapear overnight here. Send the snow down to me Jill - I'd LOVE it!! You don't know how lucky you are having it for Christmas - I'd almost kill for that!! Your snow looks great but please keep it there we have enough of our own to contend with, hope you're enjoying Christmas and just a tip for getting the snowballs off, pop his feet in lukewarm water and it will soon melt off. 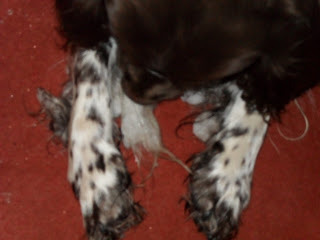 It's so much quicker then leaving it to melt and you can dry the paws to make for a cleaner drier house.